Well I've eaten my entire cherry crop. Two cherries. 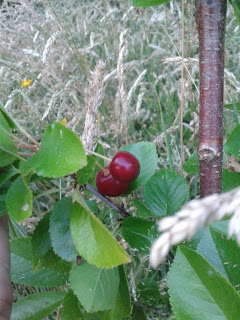 I planted some cherry trees earlier this year and to my surprise when I walked down the field I found these two beauties just asking to be eaten. I was quite please as this is the first year that they've been in. Now the question is where can I fit in more of these trees - they're a great early fruit and I absolutely love them. This winter I might have to buy some cherry root stocks and graft my own trees. Does anyone else grow cherry trees? Greedy! You could have shared! My wife said that! I was going to but they just didn't make it back! and that it what Chris would have said! lol - just couldn't help yourself could you. I have a cherry tree ready to be planted here this week - I am guessing the fruit will last about as long as yours!! I think I might plant about 10 next year the cherries taste that good! If space is limited, you could always try espalier. Well done with the cherry growing and picking. Bet they were delicious, they certainly look nice! Yeah I guess your place would be a bit warm, although if you could give them plenty of water they might do alright. just think of all the citrus you can grow that I can't! Well your crop is 100% bigger than ours was last year! !